August 8, 2014 marks the 150th anniversary of the founding of the International Red Cross. While Clara Barton worked tirelessly on behalf of the Union injured on Civil War battlefields, it was a Swiss citizen whose observations of an Italian battlefield motivated him to lead the efforts to establish the Red Cross. In 1859, Dr. Henry Dunant witnessed the aftermath of the Battle of Solferino, where more than 45,000 soldiers lay dead or wounded on the battlefield. In 1862, he published Memory of Solferino, in which he proposed to set up volunteer groups in every country to take care of casualties in wartime and to persuade governments to agree to protect first aid volunteers and wounded on the battlefield. Thus, the Red Cross was initially founded to ameliorate conditions in times of war. In 1864, the First Geneva Convention adopted an emblem that reversed the colors of the Swiss flag. During its war with Russia 22 years later, the Ottoman Empire substituted the crescent for the cross, which was offensive to Muslim religious beliefs. 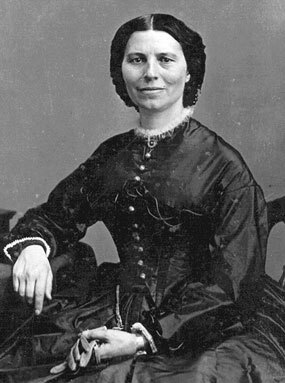 Clara Barton led the effort to establish the American Red Cross in 1881. The charity was largely identified with her during her lifetime. The American Red Cross immediately went to work leading efforts to aid victims of natural catastrophes, beginning with a Michigan forest fire in 1881; helping Ohio River and Mississippi River flood victims in 1884; leading 50 volunteers to help the victims of the Johnstown flood in 1889. The American Red Cross elected her “president for life” in 1901. She resigned three years later at the age of 82 in response to criticism about her management style, abilities, and age. The American Red Cross received its first congressional charter in 1900, and its second in 1905, one year after Barton’s resignation. By that proclamation, Roosevelt established a practice that would be followed by his successors, recognizing the American Red Cross as the leader of emergency relief in times of disaster. If the Red Cross lost one identity with the departure of Clara Barton, it forged its own two years later and regained its moral force with the Chief Executive’s imprimatur. American Red Cross, “Founder Clara Barton,” http://www.redcross.org/about-us/history/clara-barton. ICRC, “The Battle of Solferino,” June 4, 1998, http://www.icrc.org/eng/resources/documents/misc/57jnvr.htm. ICRC, “The History of the Emblems,” January 14, 2007, http://www.icrc.org/eng/resources/documents/misc/emblem-history.htm.